I love digging into a really good RPG. Back in the day my first venture into the genre came about with the release of the original Playstation. You see, I grew up with a Mega Drive as my main go-to console in our house. Sure, there were RPGs for the Mega Drive, but nothing on the level of Final Fantasy or Zelda. Nope, I just had a heap of platforming games and garish looking first-person shooters to play with sadly. On Playstation I played as many as I could get my grubby little hands on; Final Fantasy VII, Grandia, Azure Dreams, Jade Cocoon, Vagrant Story, The Legend of Dragoon, Xenogears, Wild Arms, SaGa Frontier... well, you get the idea. So when an RPG pops up on my radar for CeX, I'm more than happy to dive into it. During my time with CeX I've played everything from outstanding to horrendous RPGs, and this latest offering is thankfully more on the side of the former. Developed by Gust and out now on Playstation 3 comes Atelier Shallie: Alchemists of the Dusk Sea, a game that despite being a largely run-of-the-mill fare, is an extremely fun and relaxing adventure to take. The game is the 16th entry in Atelier series; a series that first began in 1997 with the Japan only title Atelier Marie: The Alchemist of Salburg, and has since spawned off 4 separate series called Iris, Arland, Mana-Khemia and Dusk. Each series has its own storyline, so don't worry if you haven't played every one of the 15 games so far. In fact, don't worry if you haven't played either of the previous two titles in the Dusk series too. I haven't, and I went through Alchemists of the Dusk Sea without being confused. The story is rather typical but serviceable, and focuses on two characters called Shallotte and Shallistera, both nicknamed Shallie. Apart from having the same nickname and both being alchemists, Shallotte and Shallistera lead two vastly different lives. Shallotte is a kind of down on her luck girl who simply strives for more in her life, while Shallistera is a princess on a journey to save her kingdom. In Alchemists of the Dusk Sea you must choose one of these two characters to play as, and while their story will intersect from time to time, they ultimately both have the same noble goal- to save the world from the Dusk; an approaching doom that threatens the world itself. One of the best aspects of Alchemists of the Dusk Sea is its setting. The world, despite being on the brink of apparent desolation, is always bright and cheerful. It doesn't really hit home the story Gust is trying to tell here, but it at least means that getting around the world in Alchemists of the Dusk Sea is incredibly fun and enjoyable. Graphics are a wonderful mix of what could only be described as cell-shaded with pastel colours. Everything looks cosy, fluffy, soft and just plain nice. The world map is depicted as, well, a world map, along with the torn edges that go along with that. I'll always prefer an explorable world map (like Final Fantasy I-IX), but in Alchemists of the Dusk Sea it doesn't cheapen the atmosphere of the world. Choosing locations on this world map will transport you to that location, and these locations, whether they be a forest, cave or town, is explorable in third-person mode. Almost across the board Alchemists of the Dusk Sea brings nothing new to the RPG genre, but still manages to be better than 70% of the RPGs I've played in the last year. At its heart combat here is pretty much what you'd expect from a Japanese RPG- turn-based combat, attacks such as magic and the use of unique character skills, and the ability to let characters assist each-other during battle. It's actually very generic, but that isn't to say it isn't a lot of fun. However, when it comes to combat what stands out as innovative is the crafting system. Yeah, a lot of RPGs are latching onto this idea now, but Alchemists of the Dusk Sea pretty much nails it due to its importance in the game. Arguably more in important in terms of gaining EXP than actually fighting monsters, you'll spend the entirety of the game finding all kinds of bits and bobs to help you craft new gear, items and weapons. If crafting isn't your thing then Alchemists of the Dusk Sea isn't for you, as it's simply that vital to the game. 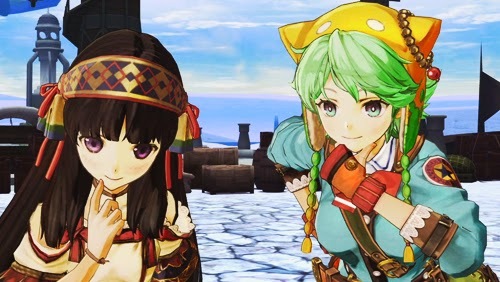 Overall Atelier Shallie: Alchemists of the Dusk Sea is an RPG that pretty much does what everyone else is doing. It has no new ideas, but despite its lack of innovation I found myself being utterly sucked into its world. From the great cast of characters, the fact that once you finish the game you can play as an entirely different character with a different storyline, the familiar and enjoyable combat, and the really charming and lovely visuals, Alchemists of the Dusk Sea sticks to the basics and concocts a great adventure. Atelier Shallie: Alchemists of the Dusk Sea cooks up a great journey and gets a 4/5.